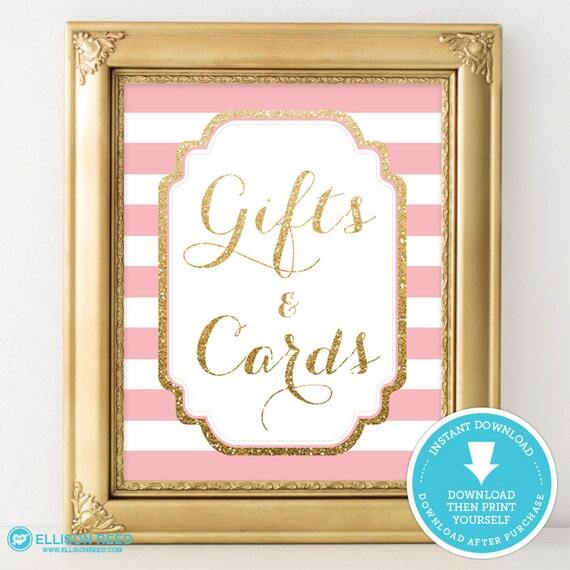 Pink and Gold Baby Shower Sign listing is for a digital printable file that you print yourself. Listing is an INSTANT DOWNLOAD. ►►Please note this design is not made with actual glitter. The design is created with a glitter texture that when printed resembles glitter. Print 8.5"x11" card stock or matte photo paper. ►No printed items will be mailed this is a digital file that you download after purchase and print yourself. ►Dimensions: Sign is 8"x10". Perfect for printing at your favorite photo center. ►File type: You will receive a print ready JPG. ► Printing: Printing is done by you. After you download your printable, you may print on a home printer, photo center, or print and copy shop. ►You may only use the sign for your personal use only. No reselling or sharing is allowed. ►Please note customization does not come with this listing. This listing is an INSTANT DOWNLOAD. If customization is needed (color, sizing, wording changes), please contact Ellison Reed for a custom listing. There is an additional fee for customization. This file is not editable. • Add this listing to your cart to purchase then download once purchased! This item is an INSTANT DOWNLOAD. You will download the printable PDF file after purchase on ETSY. PLEASE NOTE THERE ARE NO RETURNS ON INSTANT DOWNLOADS.